FAT GUYS IN THE WOODS: Blog Skill Series – COMING SOON. Well, Season 1 of FAT GUYS IN THE WOODS has officially ended. The last episode aired last night. However, the survival instruction from these episodes is just beginning. When 6 days of filming gets edited down to 42 minutes, some of the details are bound to get lost. Oftentimes, these details involve specific survival skills. Consequently, I’ll be writing a series of blog posts over the coming months called FAT GUYS IN THE WOODS: BLOG SKILL SERIES where I describe in great detail many of the survival skills I taught these guys over the course of the 8 episodes. From creative fire starts and tinder selection to traps, snares and shelter materials, there are so many skills from Season 1 that I can’t wait to teach you. IT ALL STARTS NEXT WEEK! Subscribe to the blog to be alerted of all new tutorials and news! FAT GUYS IN THE WOODS – EPISODE 3 – Don’t miss it! For those of you who are following the new survival television series I host on The Weather Channel called FAT GUYS IN THE WOODS, you don’t want to miss this Sunday’s episode. This will be the 3rd episode aired and is one of my favorites! This particular episode has a great mix of survival skills that I really think you will enjoy. We build one of my favorite shelters of the whole season and we also have some pretty crazy wild edible encounters – including one of the largest GRUB worms I’ve ever seen in my life. You’re not going to want to miss the guys’ reaction to “breakfast”! Other highlights include net weaving, some primitive fishing, cool fire building skills and also processing wild edibles! You’re also going to really love the 3 guys I take with me this week. They are all very genuine and have a sincere interest in positive change. Zach has battled with ankle issues his entire life and came to prove he can face Mother Nature and come out on top. Opie is a fellow Eagle Scout who longs be reconnected with the wilderness. It was great to spend a week in the woods with a fellow scout. Lastly, Joe is a video gamer that needs a shock to the system. Trust me, he got it! Each of them will inspire you as they battle through this crazy week in a damp, cold river valley! So set a reminder on your phone right now! This Sunday night (August 24th) at 10pm Eastern ONLY on The Weather Channel! Wow – I have had one crazy week. I’ve been in New York City all week promoting FAT GUYS IN THE WOODS and it’s been a blast. I was on the TODAY SHOW Wednesday with Kathie Lee & Hoda – CRAZY! Here’s the link to the segment if you missed it: http://www.today.com/video/today/55809202. Below is a pic of me right before we went LIVE. I was just trying not to pass out. I’ve also done 20 or so radio interviews and will be on WAKE UP WITH AL (ROKER) tomorrow – FRIDAY – at 6:40 am and then the AMHQ Morning Show with Sam Champion at 9:40 am. We’ll be talking about the show and also hurricane survival. Saturday, I’ll be in Tennessee for a series pre-premiere launch and to spend some time with some of the great folks who made this show happen. Hats off to The Weather Channel, RIVR Media, the amazing production crew and of course the show visionary Evan Goldstein. I’m writing mainly to remind you that the series premieres THIS SUNDAY August 10th at 10PM eastern ONLY on The Weather Channel. This is the episode filmed during the POLAR VORTEX last winter. Below is a pic of me and the guys in our massive wiki! Those guys are freaking awesome! Mother Nature has a very unique way of stripping away the clutter and introducing us to a very raw version of ourselves. You learn a lot about yourself when you’re exhausted, cold, hungry and thirsty. I’ve long believed the wilderness can change people. 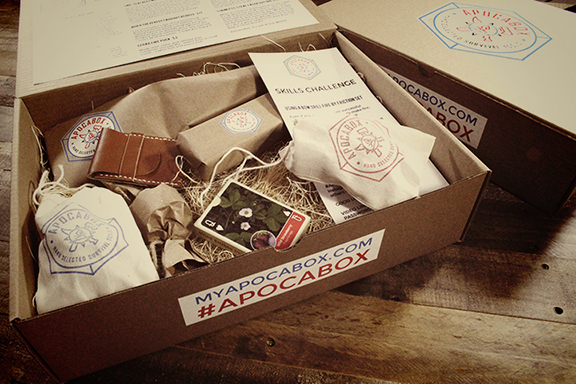 Tune in to learn some survival skills, laugh, sympathize, cheer and be inspired! OH, AND TELL EVERYONE YOU KNOW!!!!!!!!!!!!!!!!!!!!!! Hello everyone. 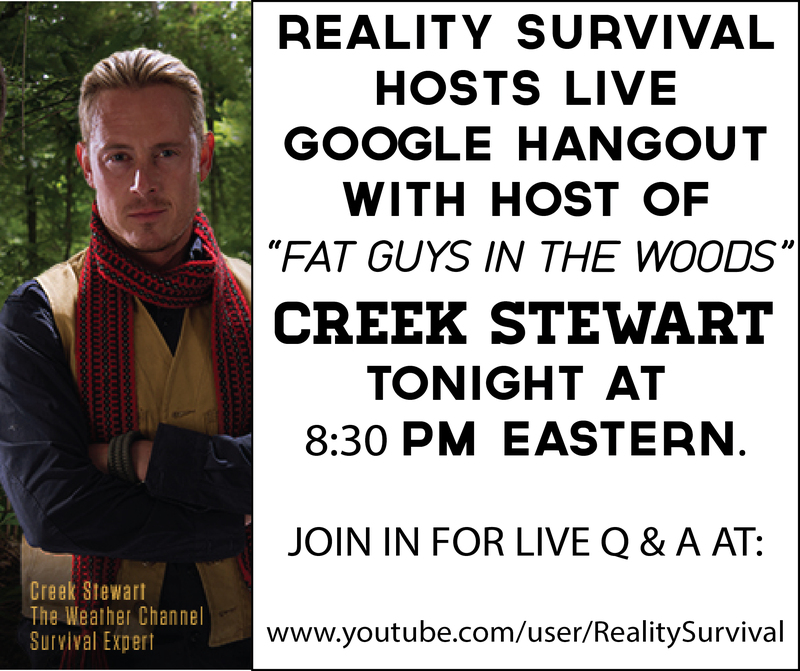 JJ over at RealitySurvival will be hosting a LIVE Google Hangout tonight (July 29th) at 8:30pm Eastern with yours truly. He’ll be asking about the upcoming show – FAT GUYS IN THE WOODS – and also discussing survival life in general. If you get a chance stop on in and HANG OUT. You can participate live with your own questions and we’ll be on for about an hour. All you have to do is go to the URL below at about 8:30pm Eastern and you can check it out. Hope to see you there! To celebrate the launch of my my new book BUILD THE PERFECT BUG OUT VEHICLE, I’m holding a BOV photo contest on INSTAGRAM. Well, it’s not really a contest because the 2 winners will be chosen by random but you get the gist. Below are the details! Not familiar with INSTAGRAM? Download the app to your smartphone. It’s FREE. Then, search using “#buildtheperfectbugoutvehicle” under TAGS to find all of the uploaded photos who have used that hash-tag. Be sure to follow @creekstewart while you’re at it. I’m on a COVER! Check out STAY ALIVE on news stands now. Hello everyone – just thought I’d share some cool news with you. I’m on the cover of STAY ALIVE! 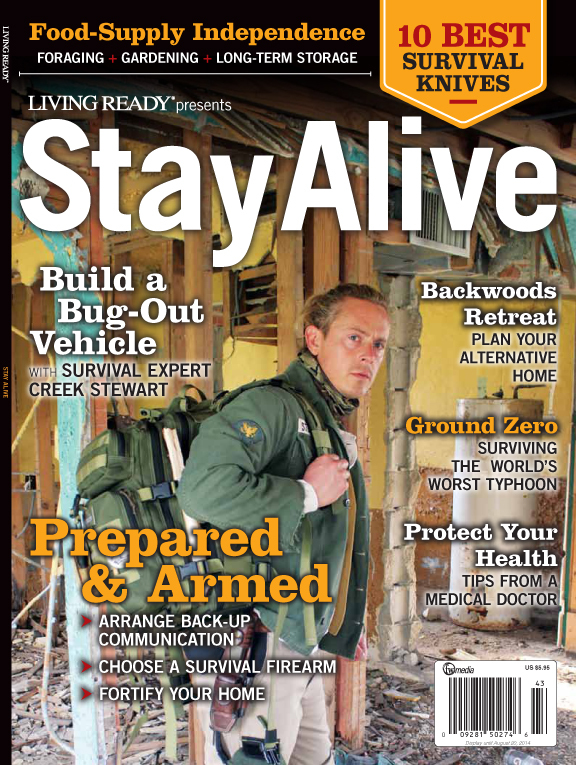 Stay Alive, the annual issue from Living Ready, offers year-round survival and preparedness information for everyday readiness. This is a great issue packed with all kinds of different articles. Thanks to everyone over at http://www.livingreadyonline.com! For those of you who have been to Willow Haven you may recognize the background in the photo. That’s our urban disaster classroom, or what I typically refer to as the Book of Eli house. That old house has been the backdrop to so many photos for me. It has a ton character. Most people wouldn’t be that thankful for an old run down destroyed house on their property but I guess I’m weird like that. It’s been a huge blessing to me. My Dad recently gave me one of his old ARMY shirts that he wore while in the service many years ago which I’m wearing in the photo. It’s used and abused but I love it. You can’t see it that well but it still has a patch with his last name on it over the chest – STEWART. I think that’s pretty cool, too. Of course, I’m sporting my Blackbird survival knife with Hedgehog sheath. The pack I’m wearing is my Get Home Bag – the Maxpedition Falcon II. I love that pack. I’m also sporting the Bug Out Bandana from our store and my favorite vest of all time under my shirt from http://www.filson.com – the Oil Tin Cloth Vest. I have beat that vest to death and it looks better now than the day I bought it. Below are several of the article topics in the magazine. It’s definitely a good read if you get a chance to pick one up. They’re at all major bookstores and also on the news stands at many grocery stores as well. Space Blanket vs. Sleeping Bag Showdown: Which One Will Keep You Warmer? Anyway – just thought I’d share this with you! Have a great week and stay in touch. BTW – I started an Instagram account for those of you who use Instagram. I’m trying to share more survival-esque photos of things you might find interesting. My account is http://instagram.com/creekstewart if you’re interested in following. 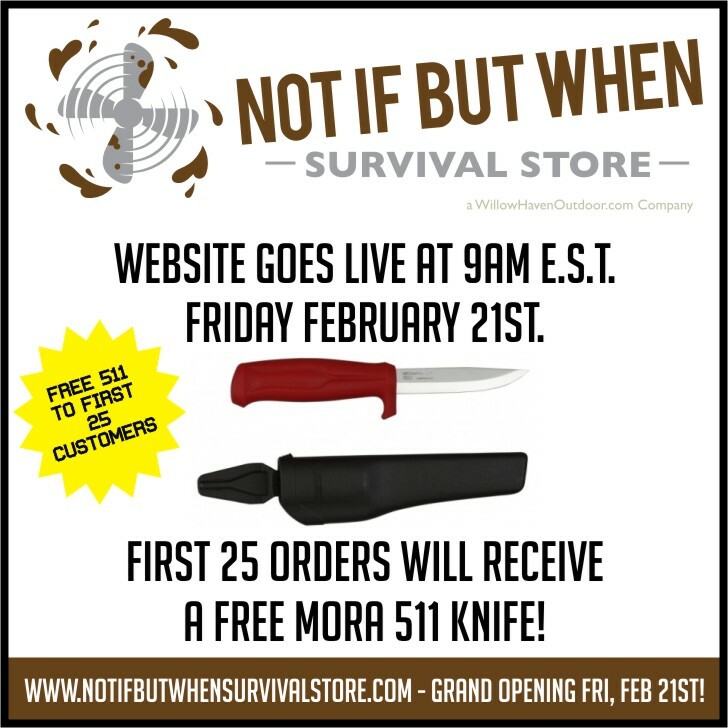 NOTIFBUTWHENSURVIVALSTORE.com to Launch Friday, February 21st at 9am e.s.t. Hello All. As many of you know I’ve been building an extensive survival products web-site over the past few months called the NOTIFBUTWHENSURVIVALSTORE.com. It’s a hand-picked collection of survival and Bug Out themed products from a variety of reputable vendors. I live by the philosophy that “It’s not IF but WHEN” we may be faced with a sudden and unexpected survival scenario. The world we live in is just too unpredictable. I believe that learning basic survival skills and owning specific survival tools is important. The ever-growing collection of survival tools found on this web-site are ones that I believe are worth owning. Whether on your person, in a purse, stashed in a glovebox or packed in a Bug Out Bag, I believe that many of these tools, combined with proper training, can give you the survival edge necessary to come out on top. I pray that none of you (or myself) are ever faced with such a scenario but I think we all know it’s naive to think it will ‘never happen to us’. The web-site will go live Friday, February 21st at 9am e.s.t. on http://www.notifbutwhensurvivalstore.com. Hopefully you see something you’ve never seen before. I will always appreciate suggestions for products that you would like to see there as well. The web-site, customer service and order fulfillment will be run primarily by my parents, Margaret & Leslie Stewart. This is their first rodeo with internet sales/order filling/email, etc… so you’ll have to give them a break initially 🙂 But, I promise they will take good care of you regardless. For those of you who have attended courses at Willow Haven and have met my parents you already know they are good, hard-working people. When you get a chance check out the site and let me know what you think of the products, design, etc. After all, it’s your support of my business that made it all possible to begin with. We’ve got some great deals running the 1st week or so. I am involved with a documentary series and we are looking for locations to film. We are looking for PRIVATELY OWNED LAND (40+ acres of wilderness). This includes woodland, swamp, desert, mountain, seaside, etc…within the United States. If you have land available for filming (or know anyone who might), please feel free to contact me directly at creek@willowhavenoutdoor. Thanks for your time & consideration. I get asked a lot of questions. I mean a lot of questions. I spend a good part of every morning replying to questions asked via e-mail and voice mail. I get asked a lot of questions at our training courses here as well. I also get asked a lot of questions at speaking venues and book signings. I never get tired of them and am always happy to share whatever knowledge I have about whatever the subject that is being discussed. How did you make your dream of becoming a survival instructor a reality? Many ask this question, or some version of it. Some, it seems, are more interested in this topic than survival information. I always find that interesting and because it happens so often, I’m convinced there must be something to it. I thought I’d take a moment to tell a little bit about my story and maybe shed some light on exactly how my career came to pass and how, in fact, I made it happen. The last few words of the previous sentence are written with intention. Notice I didn’t write ‘and how it happened’. I wrote ‘ and how I made it happen’. It’s that small difference that can determine whether or not something comes to pass. We’ll get into more of that later. For now, let’s start at the beginning. Yes, I was a Boy Scout. And, yes, I am an Eagle Scout. I get asked that a lot too. Boy Scouts reinforced my love for the outdoors and my interest in self reliant skills. Remember, the Boy Scout motto is ‘Be prepared’ after all. I’ll always have fond memories of my time in scouting. I also grew up on a farm and spent most of my childhood outside. Long story short, I discovered at an early age that I’m happiest in the woods. High school happened. Then college. I graduated high school and then went to Butler University in Indianapolis, IN. I actually started as a pharmacy major – HA!!!! It didn’t take me too long to figure out I was hiking the wrong path with that choice – no offense to my pharmaceutical minded friends 🙂 I settled on a business major. I was now in the city, but found myself in between classes and on weekends wandering the small patches of woods that spotted the campus . I longed for the feeling of being submerged in nature. It was definitely missing from my life and I knew it. It all came to a head one day with a crow. Yes, a crow. You know, the bird – black with a really annoying call. Well, there was a certain crow that came every morning to the yard just outside my dorm window. It always came early and always made an insane amount of noise squawking and calling. It’s call echoed throughout the small grass courtyard and tormented me awake each morning. Somehow, this daily diatribe of squawks and cackles summoned the inner woodsman in me that the city and college life had so subtly repressed. 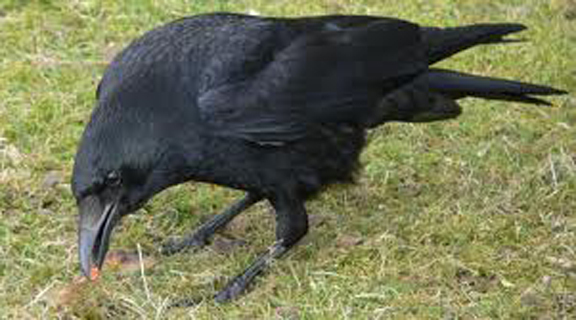 I decided to set a snare for that crow, which I had now named after one of my least favorite pharmacy professors. I still remember the thrill and challenge of building that snare. I was trying to outwit one of the smartest and alert birds on the planet. I don’t remember much about college but I remember that incident like it was yesterday. Everything had to be perfect; the trigger I carved from the pine tree in the parking lot, the knots I tied into the dental floss line, the bait, the placement, the timing, everything. It was me against thousands of years of pure natural instinct, now bird-animal against human-animal. For that moment, I was a primitive hunter in the small courtyard of my college dormitory. I’ll never forget the horrified look from the girl looking out her window opposite my room as she watched me haul the flapping squawking crow by the feet up the side of building to my window on the 3rd floor. I didn’t care. No one was going to steal the glory or joy of my primal victory. Part of me wonders if she was happy to see it captured as well. Don’t worry, I didn’t have the heart to kill it up close so I let him go. Needless to say,though, he never came back. I still say a quick Thank You to the good Lord every time I see a crow. Those birds represent a time when something changed in me. If you ever want your dreams to come true then at some point you have to stop thinking and start acting. Soon after ‘the crow’ I decided to take steps toward what I determined was my long-term goal: TO TEACH WILDERNESS SURVIVAL SKILLS. I checked with the school administration but they didn’t have a WILDERNESS SURVIVAL major. “What kind of school is this,” I thought. “No Wilderness Survival Major? What has the world come too?” I’m just kidding – I stuck with the business degree but started putting together a PLAN B immediately. I spent most of my free time during my sophomore year at college writing my first survival manual. It was a 90 page self published book with hand-drawn sketches of the survival skills I knew at the time – which wasn’t much. I didn’t make excuses. I moved forward. No, I wasn’t qualified to write a survival book. In fact, I wasn’t qualified to write any kind of a book on any subject. No, I didn’t have a publishing contract. I also didn’t have any money. But, I didn’t let any of that stop me. I pushed forward anyway and made no excuses that might somehow allow me to quit. When my friends were down the street partying, I was writing and drawing and researching. Oftentimes, in order to be successful, you must do what others aren’t willing to do. You must be willing to make sacrifices. That was just fine with me. I photocopied my book at Kinkos and had them spiral bind it. In my mind, I was a published author! Nothing could stop me now! I called local Boy Scout troops. “Get back to my roots,” I thought. I traveled from troop to troop giving FREE survival demonstrations as an attempt to hawk autographed copies of my new book. That went pretty well but I didn’t like having to travel to meet my customers. “How can I get them to come to me,” I wondered. “Aha! I’ll host a survival course! I won’t even charge. I’ll just sell my books,” I told my Mom and Dad while trying to convince them to allow me to invite total strangers on our farm so that I can teach them survival skills in the woods behind the house. I wish I was a fly on the wall in my parent’s house that evening. I’d do anything to hear that conversation. Thank God for good parents because they let me. They were also still confused about me not being a Pharmacy Major. That’s another story for another day. Teaching that first course taught me MANY lessons. 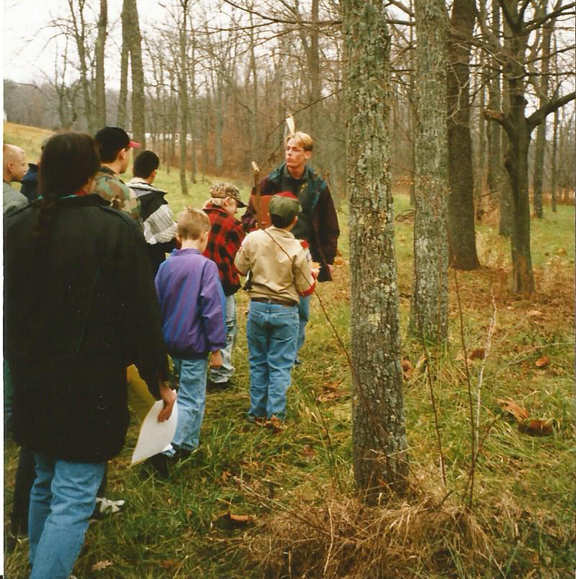 First, I learned that I needed WAY MORE DIRT TIME in the field in order to REALLY teach survival skills. Second, I learned that I LOVED DOING THIS. For the first time in a long time I felt like I was on the right path to something that fulfilled me. I had peace with a direction. I was combining my love for self reliant survival skills with my joy of working with people. It was perfect. Now, how in the world do I make a living doing this? Here are a couple photos from my first ever survival course. “I’m a business major, I can figure this out.” I invested a few hundred dollars in an ad at the back of Boy’s Life magazine. Boy’s Life is a magazine for Boy Scouts. If you were in scouting then you know what it is. 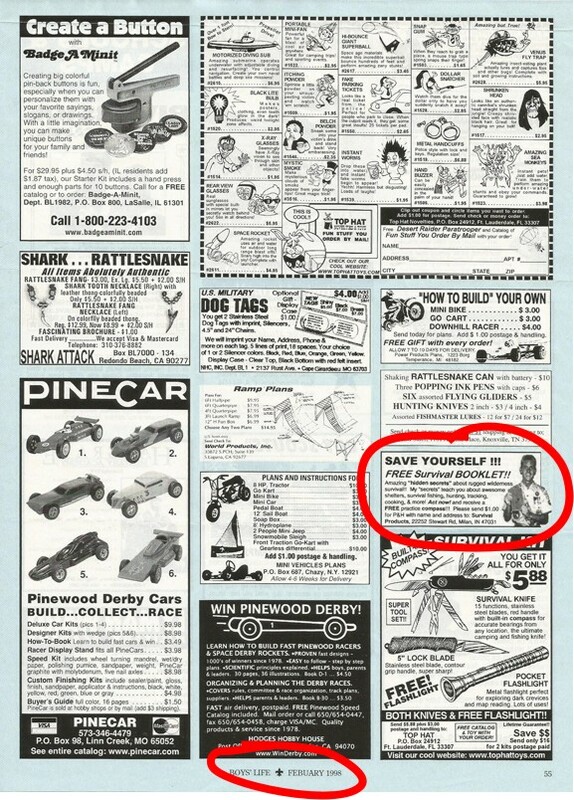 As a scout I would scour the little ads in the back and often begged my parents to order me the X-Ray Glasses and Magic Sea Monkeys. I figured this was the perfect place for me to offer my new survival book. Was I prepared for the flood of orders????? My marketing strategy was to offer a FREE survival booklet which was a teaser to order the full book for $15. I even posed for the camera in my Boy Scout uniform (my Mom took the photo in our living room). I was ready to be a millionaire! The orders did not come pouring in like I imagined. There are no get rich quick schemes. As Thomas Edison once said, “Opportunity is missed by most people because it’s dressed in overalls and looks like work.” I think here is a good time to tell you that I am not especially gifted at anything really. I’ve always said that my best gift from God is me being too stupid to know any better. I grew up watching my parents work extremely hard. They never complained, they just worked. They instilled in me that if you want something then you’re going have to work for it. Sometimes they failed but they never quit. I wasn’t going to quit either. For me, failure wasn’t an option. I knew it was going to be work. I had to spend 100s, even 1000s of hours practicing and perfecting the skills I wanted to teach AND I had to figure out how to build a business around teaching survival skills. Talk about a tough business model. You can’t find a book on this one! I think you know you’re on the right path when your passion for the subject doesn’t die even though you aren’t getting the positive feedback you want. 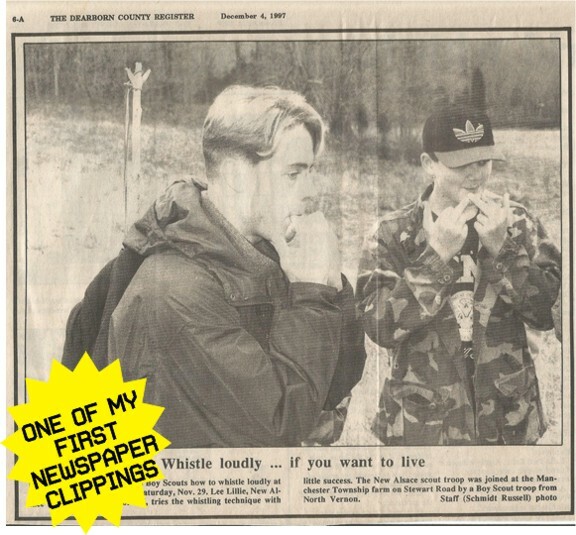 Even though I wasn’t able to make a living with survival skills & writing at the time, I still enjoyed doing it. I still believed that these skills were important and I still enjoyed working with people. 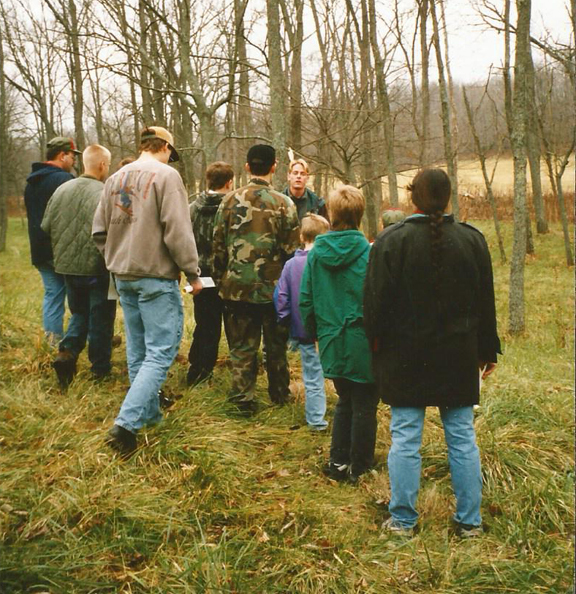 Yes, I wanted to teach survival skills as my career. But, I had to make money and pay bills too. For many years, teaching courses and selling books was supplemental income. If I taught survival skills for the money I would have quit in year 1 for sure. I could not have survived financially for very long if I wasn’t working other full-time and part-time jobs. Here comes that whole SACRIFICE thing again. Well, I was getting pretty good at working evening and weekends to make my long term dreams come true. I worked for over 10 years doing other things as a means to an end so that I could one day do what really fulfills me. I had a t-shirt business. I had a snow-cone business. I sold door knobs for a major hardware brand. I worked nights at major shipping carriers. Here’s the kicker – I turned down awesome job offers out of school from big name Pharmaceutical Companies for pharmaceutical sales positions. I guess a half Pharmacist & Business Major sounded like a good thing to some people. Trust me, those jobs were enticing but they would have never allowed me the flexibility to build my own business on the side. I’m sure my parents were convinced I had lost my mind. The reality is that I was prepared to lose everything for what I wanted. Sure, it was a risk but I remembered a quote from Goethe – “The dangers of life are infinite, and among them is safety.” I wanted more than ‘safe’ and ‘secure’. Building my business was anything but easy. I’ve always said – “If it’s worth having then it’s worth the effort.” Just as Robert Frost wrote in The Road Not Taken, ” Two roads diverged in a wood, and I – I took the one less traveled by, And that has made all the difference.” Oftentimes when following your dreams, the path will certainly be less traveled. It will be overgrown with wild rose and stinging nettle. Occasionally, though, those roses will bloom and you might as well make tea and cordage from those nettles. Perspective is everything and the journey builds character and perseverance. Even if you fail, you still have the journey. That’s more than many will ever see. I’ll never claim to know everything about anything. I learn new survival tips and tricks every day AND I learn life lessons every day. When your classroom is Mother Nature you learn really quick that you’ll never learn all there is to know. She is absolutely and unequivocally unpredictable. It’s funny, I’ve studied survival skills now for over 15 years. For most of those years I only focused on physical skills such as fire making, shelter building, etc. However, there is a whole new world of skills to practice. These are the mental survival skills. Unlike the physical survival skills, we can use mental skills in our daily life. In fact, I’ve discovered that if you think using many of these mental survival skills every day then your life can change. Below are just 3 of many mental survival skills that can not only help you survive any scenario, but can also change your life! The Absolute Refusal to Give Up: Never give up no matter how bleak the circumstances. The MacGyver Factor: Use what you have to get what you need. Exorcise the Demon named Negativity: Do not tolerate negative thoughts or negative people in your life. So for those of you who’ve asked ‘how I’m able to do what I love’ – this is my best answer. Hopefully it’s been insightful. I look forward to training with you in the field sometime soon.